Decibel Eleven Switch Dr. Review - Best MIDI Controller/Loop Switcher? Decibel Eleven Switch Dr. Review – Best MIDI Controller/Loop Switcher? Review of: Decibel Eleven Switch Dr.
Guitarists are always looking for convenient ways to gain greater control of their rigs. From simple tasks like selecting effects pedals and amp channel switching to full-on MIDI control of digital effects pedals and MIDI-compatible processors, a solid all-in-one MIDI controller/loop switcher that is actually easy to use would be a dream come true for many guitarists. The Decibel Eleven Switch Dr. looks to make this dream a reality and could be just what the doctor ordered. Is it the best MIDI controller/loop switcher available? You’ll find out in our Decibel Eleven Switch Dr. review. The Switch Dr. is built in the same vein as Decibel Eleven’s groundbreaking Pedal Palette, featuring the same familiar enclosure and footswitch layout with 4 true bypass effects loops. But do not mistake the Switch Dr. for some lesser version of the Pedal Palette. The Switch Dr. boasts its own entirely unique feature set which sets it apart from the Pedal Palette and other products in its class. In addition to its 4 true bypass effects loops, the Switch Dr. allows up to 3 switch control functions for amp channel switching and a full array of MIDI compatibility. Here’s a detailed account of the Switch Dr.’s features before we dive into the review. Optional analog discrete Class A input buffer – for retaining top end sparkle and preventing pickup loading. Direct mode for instant access to individual switches – activated at anytime allowing direct, instant access to the effect loops and control switching. Optional “global” default preset can be accessed from any bank at any time. Visit Decibel Eleven for more info about the Switch Dr. The Switch Dr. really caught me by surprise. It’s one of those products that sounds like a good enough idea at first that you’ll want to give it a shot. But then something else happens. It’s only after you’ve tried the Switch Dr. and have really spent some time with it that you come to realize just how indispensable it is to your guitar rig. Covering the basics first, the 4 true bypass effects loops are an obvious convenience for selecting up to 4 different effects loops in a live situation. The Switch Dr. stands apart from your typical passive effects loopers in that it will route your signal around any effects loops not currently in use. This helps alleviate any fidelity loss suffered from having your signal hit extra loop point junctions when they’re not in use. If you have additional concern about any unwanted degradation of signal integrity, an optional Class A transparent buffer (activated by a convenient “In/Out” switch on the top panel) will ensure a consistent signal without coloring your tone. This is really handy if you’re using long cables and/or have a complex pedal set up. The Switch Dr.’s effects loops function as expected with quick, seamless transitions from activated to bypassed via true bypass switching relays. The red lights above each footswitch make it easy to always tell when a particular loop is active whether you’re in Direct or Preset mode. The SW1 and SW2 functions for amp switching are easily accessed by dedicated jacks on the back of the Switch Dr. To use the SW3 function requires you to give up one of your effects loops, a necessary sacrifice if you really need that 3rd control function switch. But most needs will only call for 1 or 2 control switches as 2-channel amp switching is most common. In Direct mode the Up and Down footswitches will scroll through up to 4 different instant access pages, allowing the 4 footswitches across the bottom row to serve different functions. One page (LPS) is for control of the 4 effects loops, another (FnS) is for the function switches (SW1 & SW2) that may be used for amp channel switching, and the last 2 (CC.A & CC.B) are for MIDI continuous control On/Off messages. In summary Direct mode lets you select various effects loops, amp channels, and MIDI commands for individual use. It’s also where you create such combinations to save as presets which is where things get really interesting. Preset mode lets you access up to 128 presets in 32 banks of 4 presets each. The Up and Down footswitches scroll through the available banks. When you have a preset selected, you can still hit the Edit/Store footswitch to access individual switch functions. The page you were last on in Direct mode will be immediately available for quick access. You could use MIDI to activate or disengage an effect or perhaps even trigger sounds on a laptop equipped with Ableton Live or perhaps select presets on a synthesizer. The creative possibilities are endless. If you’re tired of dancing around your pedalboard trying to select presets and switch various effects on and off, you’ll greatly appreciate the Preset mode of the Switch Dr. With a single press of one of the Switch Dr.’s footswitches, you can activate and disengage several different effects, switch presets on multiple pedals via MIDI, and switch the channel of your amp. It cannot be overstated just how convenient this is. The Switch Dr. allows you to send multiple Program Change and Continuous Controller messages across multiple MIDI channels, controlling several MIDI-compatible pedals at once. In the accompanying review video, I show briefly how easy the Switch Dr. is to use in Direct and Preset mode and how it can control popular MIDI-compatible digital effects pedals. If you use high-end MIDI-compatible effects pedals like those from Eventide and Strymon and need an effective way to seamlessly integrate them into your rig with other effects pedals, the Switch Dr. is potentially a must-have. You also don’t necessarily have to include such digital pedals in the 4 available effects loops to turn them on and off as you can do so via MIDI. A MIDI-compatible digital reverb pedal, for example, that would usually be placed last in your effects chain can be placed after the Switch Dr. and be turned on and off with MIDI commands, freeing up an effects loop to be used with a non-MIDI pedal. The Switch Dr. also has a dedicated MIDI expression pedal jack that can be assigned to control all kinds of functions via MIDI CC commands. The truly adventurous musicians out there will surely try controlling several parameters from multiple guitar pedals at once. An effects pedal using keyboard player may even control their effects pedals and synthesizer parameters simultaneously. The possibilities of the Switch Dr. with MIDI know no bounds. The Decibel Eleven Switch Dr. certainly has the makings of an essential performance tool. Let’s see the final result. The Decibel Eleven Switch Dr. is an outstanding tool for integrating loop switching and MIDI into your guitar rig. Functional, practical, and easy-to-use, the Switch Dr. will become the command center of your pedalboard, allowing instantaneous switching of your pedals, their presets, and your amp’s channels. You won’t fully understand how much you need the Switch Dr. until you’ve tried it. Want to take control of your rig with the best midi controller/loop switcher? 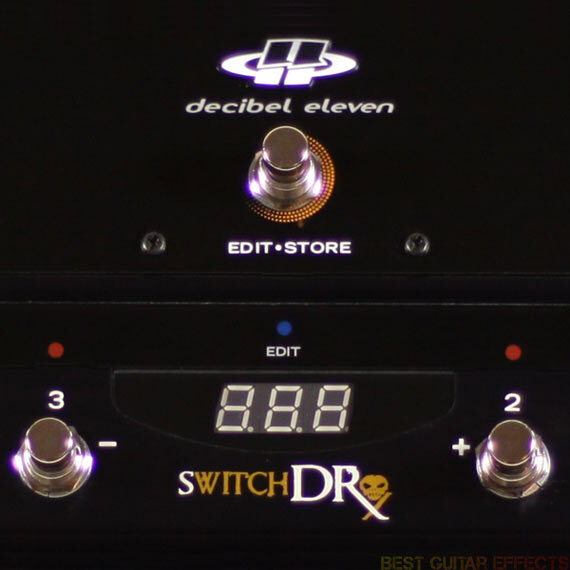 The Decibel Eleven Switch Dr. is one of the leading options available. That concludes our Decibel Eleven Switch Dr. review. Thanks for reading. Want to buy the Decibel Eleven Switch Dr.?